Take 8 fine, ripe, yellow quinces, scrub them well to remove any down and cut away any brown bits. Cut the fruit in quarters and chop roughly (no need to remove the peel or cores). They’re very hard, so a good, stout knife will be necessary. Put the chopped flesh in a preserving pan. Add enough water to cover the chopped quinces (about 8 cups, depending on your pan and the size of the quinces). Simmer quince very gently for about 45 minutes or until soft when pierced with a knife. Tip the quince into a colander lined with a muslin or other fine cloth set over a large bowl. Leave overnight to let the juice seep gently out – it’s permissible to give it a bit of a squeeze at the end to extract maximum juice, but don’t overdo this or the juice will be cloudy. Discard all the pulp. Pour juice into a measuring jug. For every 4 cups of liquid, allow 1½ pounds of sugar. Put juice and sugar, plus the juice of 1 lemon, in the preserving pan. Bring to a rolling boil, then boil for 20 to 30 minutes. Start testing for a good set after about 25 minutes: Place a saucer in the freezer, spoon a little jelly onto it, leave for a few seconds, then pull your finger through it. The jelly should wrinkle and form a distinct channel. 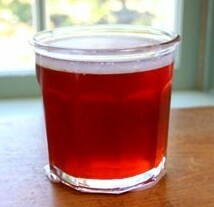 Pour jelly into sterilized jars and cover while still warm.